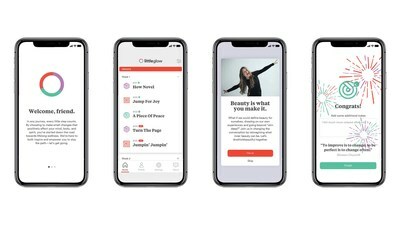 SECAUCUS, N.J., April 3, 2019 /PRNewswire/ — Lycored, industry leaders in cultivating wellness, announced the unveiling of their new interactive app, littleglow, designed to make wellness easy and accessible by delivering powerful mental, physical and spiritual activities to your phone each week. As the latest initiative in Lycored’s #rethinkbeautiful campaign, littleglow is your guide for breaking down barriers of self-doubt and building small, inspiring moments into your everyday. The app reinforces the idea that beauty and wellness go hand in hand, and that making time to care for ourselves allows us to manifest beauty in the world around us. “We want to ignite self-discovery, empower healthful changes, and make mindfulness accessible to the masses,” added Zev Ziegler, Head of Global Brand & Marketing (Health) at Lycored. Designed in partnership with Madwell, a Brooklyn-based creative agency, littleglow helps you redefine your personal beauty-meets-wellness narrative through a fresh slate of engaging exercises, known as Pops of Positivity. Each Pop offers a different daily activity to nurture your greater wellbeing, focusing on one of three categories: Mind, Body and Spirit. Each category is equally balanced to deliver a holistic approach to beauty, health and happiness, and an understanding of how all contribute to wellness. “I think wellness can often feel exclusive or intimidating to people. We wanted to flip that script and put more focus on the journey towards betterment versus the end result. Each Pop of Positivity is meant to push you a bit outside of your comfort zone so that little by little, day by day, you grow. It’s the realization of the idea that ‘every little step counts,'” shared Laura Wasson, Creative Director at Madwell. Track your incredible progress as you climb higher on your road to wellness – Small activities really add up! The journey towards wellness begins with a single download. Give your day a boost by downloading littleglow for free today via the App Store or Google Play. For more information, visit www.littleglowapp.com. Committed to ‘Cultivating Wellness’, Lycored, part of Adama Group, is an international company at the forefront of unearthing and combining nature’s nutrition potential with cutting edge science to develop natural ingredients and products. Established in 1995 in Israel, Lycored is the global leader in natural carotenoids for food, beverage and dietary supplement products. For more information visit www.lycored.com. True beauty begins on the inside. At Lycored, we’ve seized an opportunity to show the warm heart behind our hard science by encouraging thousands to #rethinkbeautiful. Through this initiative, we educate the public on the role ingestible skincare plays in promoting beauty from within, bridging meaningful connections between the nutrition industry and the consumers it serves. Our mission is to empower all people to challenge traditional notions of beauty defined by society, and redefine beauty on their own terms. Our award-winning outreach has inspired tens of thousands across the globe, and we’re just getting started. To get involved, visit www.lycored.com/rethink-beautiful/.